I've been feeling like summer came to such an abrupt halt. Maybe its all the scheduling and organizing that I seem to be doing whatever it is I just don't think I am quite ready for the more easygoing schedules in our home to end. 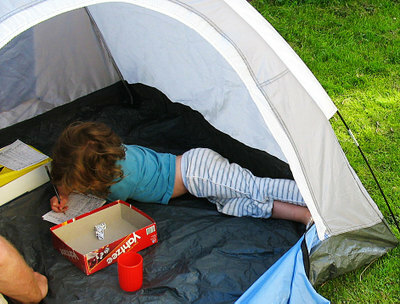 But I came home from work today and found my girl and her Papa playing Yahtzee in the yard in a tent. Scratch that. Her tent. A friend of ours had accidentally bought herself a kids tent and found when she went to stretch out she was a wee bit too long for it so passed it on to our girl. There's something that hits me deep when I see a tent set up in a yard. Its got summer written all over it. Freedom too and well I think it reminds me of my kid-hood and sleeping in a tent in my friend's back yard during a girl scouts' camp-out. I grabbed my camera to capture this time and to remind myself we can always sprinkle a little bit of summer fun into our days one way or another. My girl and her Papa spent some of their day before the Yahtzee tent party planting our winter/fall veggie garden and various other plants we'd yet to put in the ground. And me, well I got busy pulling weeds...again...see summer never ends. 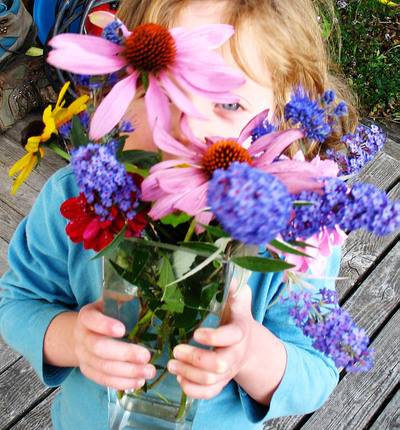 And then, my girl surprised me with this fresh picked bouquet. Now there's a little summer in a jar. And to Fall. I do love you. You are one of my favorite seasons. I felt you say hello tonight with a little chill in the air and yes that feels good. Oh, my gosh, that last photo made me grin! It's so full of colour!